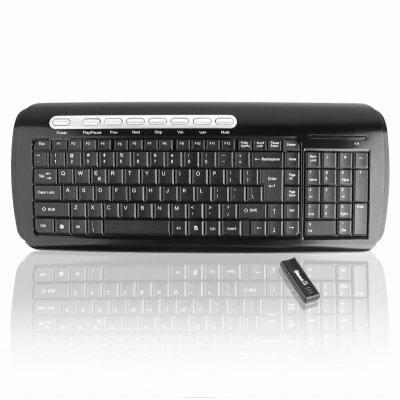 Successfully Added Black Bluetooth Keyboard + Dongle Set - Windows + PS3 Keyboard to your Shopping Cart. Bluetooth enabled black keyboard and Bluetooth dongle for pairing with Microsoft Windows OSs including Vista and also for pairing with a Sony Playstation 3 for a really cool gaming accessory. This standard layout QWERTY keyboard also features 8 function keys for easy control, ABS construction, 1000dpi, and long lasting power from 2 AAA batteries. Get rid of all those wires cramping your style and stealing your space with this made in China computer Bluetooth Gadget.